Hmm, I don’t really know to be honest. I do know that if you pay for cable TV you can watch hours upon hours of utter crap (most of it from America and the UK). I have, at one time or another, been addicted to the entire Food Network, the antics of the Kardashians, all three versions of CSI and, of course the adventures of Bear Grylls. And whenever I’m not looking, David will watch sports and Ultimate Fight Club (I just can’t with that show). For the most part though we don’t really watch broadcast television, preferring box sets. There are, of course, several programmes on TV aimed at Arabic audiences but the only one I’m really aware of is a show called “Arabs Got Talent” (yes, it is exactly what it sounds like), which became an overnight sensation when it debuted about a year ago. Do yourself a favour and check it out at Arabs Got Talent. I promise you won’t be disappointed! CAN YOU BUY PORK IN DUBAI? Yes, you can. A few supermarkets have special little enclaves in which you can purchase basic pork products. They usually have a cute little sign on top stating “Pork: Not For Muslims” (you know, just in case they weren’t sure). It’s a little harder to find restaurants that have pork on the menu. The reason being that the license required to serve pork is associated with the license required to serve alcohol – and those are exclusively reserved for eateries in the large, five-star hotels. Also, I imagine the logistics of keeping the kitchen “uncontaminated” by pork would be quite difficult. For instance, a knife and chopping board used to prepare a pork dish could never be used for any other non-pork foods. As an unfortunate consequence of this, there is a proliferation of bacon substitutes on offer around the city. Trust me when I say that veal bacon, beef bacon and turkey bacon are all pretty bloody awful and best avoided if you don’t wish to insult your taste buds. It’s not all bad though. Very recently I was scouring the city looking for some Jamón Iberico (yeah, right!) for a Spanish tapas dinner party I was planning. I had almost given up hope when I stumbled across the gourmet deli in Galleries Lafayette (a French department store in the Dubai Mall). While admiring the lovely epicurean delights on offer, David and I surreptitiously inched our way towards the requisite room up the back. As we approached the “Not For Muslims” sign, the opaque sliding doors parted to reveal a cornucopia of all things pig! I do believe that, as the doors slid closed behind us, I jumped up and down and squealed (aptly) for joy. We were surrounded by handmade chorizo, French pork sausages, prosciutto, smoked hams, streaky bacon and much, much more – and in the centre of this plethora of pork, majestically displayed in a large vice-like contraption, was a full hindquarter of corn-fed Iberico pig, hoof and all. I sincerely couldn’t believe my eyes. The attendant, noting the object of my attention, took a carving knife, sliced a little morsel of the deep rose flesh and ceremoniously handed it to me to taste. Oh my god, it was heaven! Suffice to say I have a new favourite shop in town! THERE’S A LOT OF SPORT IN DUBAI, BUT WHERE TO “REGULAR” PEOPLE EXERCISE? Yes, just like Australia, the UAE is pretty sports crazy. Things here work a little differently than back home though, in that summertime sends us scampering indoors to hibernate, watch DVD box sets and lose the tan that we acquired during the lovely winter months. But conversely, those winter months are perfect for all sorts of outdoor activity. Blue skies and average temperatures of about 24ºC entice a lot of people out of their caves. People run, walk, cycle, rollerblade, do yoga in the park, swim, sail, surf and even get their butts kicked in beachside boot camps (which is always fun to watch). When it starts getting too hot to exercise outside, the majority of people retreat to the air-conditioned comfort of a gym (though, naturally, there are a few crazies who exercise outside all year round). Most apartment buildings have a gym (and pool) for residents to use. There are also plenty of stand-alone fitness centres around town offering not just gym equipment but all sorts of classes to whip you into shape. Yoga and Pilates are also both very popular here. In addition to all this, Dubai boasts the highest number of personal trainers per capita in the world (I’m actually just making this up, but there sure are a lot of them around and until someone proves me wrong, I’m sticking with it). WHAT COOL BANDS TOUR DUBAI? I’ll tell you who tours the UAE. Elton John likes touring here. Rod Stewart. Duran Duran, Sting, Gipsy Kings, Snow Patrol, Dave Dobbin, Britney Spears. Amy Winehouse toured here, five months before she died (and it was not her finest hour). The Eagles are set to tour. Engelbert Humperdinck was here two weeks ago! I am so not joking. Now, please don’t misunderstand me. I’m not saying that the performers I’ve mentioned above aren’t good quality performers – or that they don’t put on a good show. I mean, come on, it’s Engelbert Humperdinck, people!!! No, I’m not saying that at all. I’m just saying that they’re not my thing. I long for some promoter to book Sia for an intimate gig in town. Or Bill Callahan. PJ Harvey would be great. TV On The Radio? Leonard Cohen? Unfortunately, I just don’t see it happening, and that makes me sad. DO YOU EAT OUT MUCH? WHAT KIND OF RESTAURANTS DOES DUBAI HAVE? We don’t eat out that much – we did when we first got here and we (rapidly) maxed out our credit cards, and put on an amazing amount of weight. So, now we tend to go out to eat only on special occasions or when we have guests in town. As for what kind of restaurants are available here, I’m pretty sure that if you can think of a cuisine you can find it here. Argentinian, Korean, Italian, Ethiopian, Afghani, Nepalese, Indian, Pakistani, German, Mexican and Russian. There’s seafood, all types of Asian, steakhouses, fish and chips, vegetarian, halal, middle eastern and so much more. In fact, a search on Time Out Dubai’s online restaurant section reveals over 1500 choices. If you can eat it, chances are you can eat it in Dubai (and yes, that even includes pork). Unfortunately though, simply because it’s available doesn’t mean that the quality is that great. My experience of dining out in Dubai is that there are very few places that do consistently good food. The rest? Not so good. Strangely enough, it is in the higher end restaurants that I have found the food generally to be bland and uninspiring (which is really insulting considering how much it costs to eat at these places). Also I’ve found the service to be grossly complacent (if not sometimes outright incompetent) – which I don’t necessarily blame the servers for. In Dubai, it appears that restaurants prefer quantity of staff, over quality. The servers are rarely trained to give a high standard of service, so how can it be their fault when they fail to deliver? It’s difficult to say if the complacence is the cause, or borne, of the number of restaurant closures in town but it seems that not a week goes by that one restaurant or another doesn’t pack it in, to make room for some new (optimistic) venture. Speaking from a non-financial perspective there just doesn’t seem to be that much investment in creating great dining spaces here, which is such a shame. More attention goes towards importing already established eateries (Rivington Grill, The Ivy, Ruth’s Chris Steakhouse and Nobu are just a few). Another common ploy is to stick a famous name on the door. There are dozens of renowned chefs who have opened restaurants here. And, unfortunately, fewer than a handful of these chefs frequently visit to check on the menu or even (shock, horror!) cook themselves. Of course there are a few exceptions. For special occasion dining it is very hard to go past Reflets par Pierre Gagnaire – a restaurant we have been to several times to celebrate both of our birthdays, and our wedding anniversary. A new favourite is Table 9 By Nick & Scott, the successor to Gordon Ramsay’s Verre restaurant in Old Dubai (if you are interested in reading my review of this, and other restaurants, please visit my other site “Foodie In Dubai” – still a young project but one I will definitely be growing). On the other end of the food spectrum we have the simple, canteen-style eateries where the majority of the population (being from the subcontinent) go to fill up on a daily basis. There are several places in the city where you can get a couple of fantastic curries and delicious, fluffy naan for less than the cost of a bottle of water at one of the fancier places. Ravi’s is fantastic, and considered a Dubai institution. And in the middle we have a few stalwart favourites – such as Mango Tree, our favourite Thai place where we (unadventurously) take all our overseas guests for a fantastic meal. It’s always a winner, consistently serving up tasty, authentic Thai food and great cocktails! So hey, why wouldn’t we take everyone there? Certainly, no one has complained yet! I’ve recently discovered a great new blog (The Hedonista) written by a fellow Australian chick living in Dubai who loves the same things that I do (food and travel) and posts far more often than me. Even if you don’t live in Dubai, if you are interested in food and travelling then I think you’ll enjoy reading her. Check her out. The alarm went off at 9.00am and I groaned. I’d only been in bed about an hour and it was already time to get up. But I didn’t hit the snooze button. I had somewhere to be. Somewhere important. I won’t lie and say I bounded out of bed, it was more like an oozing motion. You see, I had finished work that morning at 7am and by the time I got home, showered and flopped into bed there was only enough time for a quick nap. But still, I was charged up on the excitement of the day’s project (and the seven espressos I’d had during the night shift). After a quick breakfast (and yet another espresso), David and I headed off to meet Roshni Raimalwala at her apartment. Roshni is the woman and driving force behind Karama Kanteen, an initiative which strives to provide food and general assistance to the beleaguered men who build the foundation upon which we all live in Dubai. The poorest, lowest class of citizens. I’m talking about the construction workers and labourers. 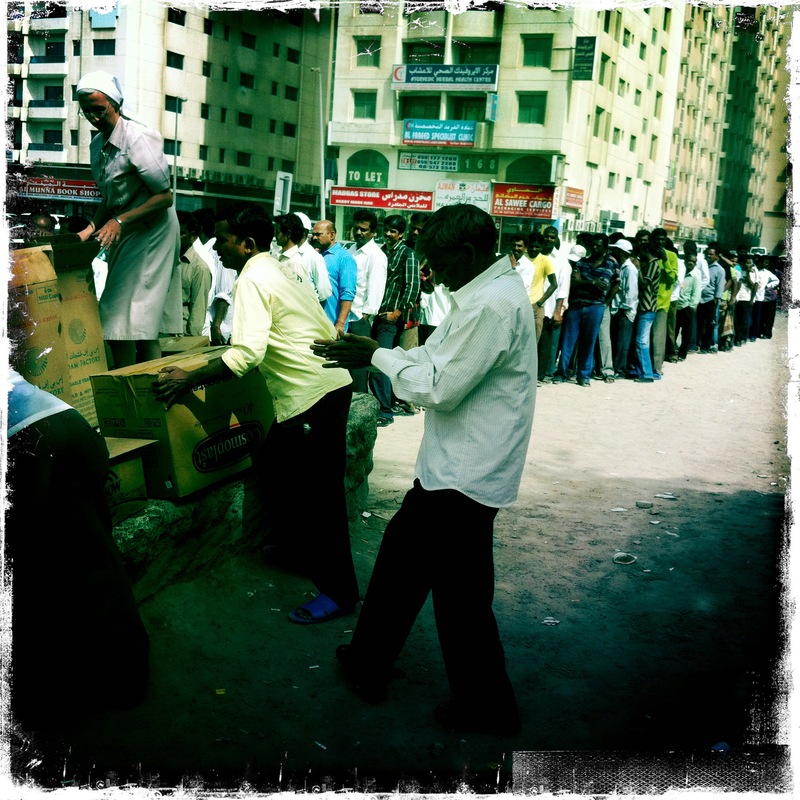 Every single weekend, Roshni is out there at the labour camps, or neighbourhoods in which these men reside, handing out food which is donated by schools, companies or individuals. Late last year David and I donated some food for Christmas hampers that were handed out during the festive period. Unfortunately, we had been unable to co-ordinate time off to help distribute it. This time around, we both had the weekend off and arranged to meet with Roshni to help give the food to the men ourselves. When I published my Xmas ejo last year I asked for donations from readers so that we could, collectively, bring a small ray of light and hope (in the form of a hot meal) into the lives of a few over-worked, underpaid labourers. Several, very generous, people contributed towards the cause and together we raised 4500dhs (equivalent to about AUD1135). This was enough to provide a hot chicken biryani meal to 450 men. That is amazing! We got to Roshni’s apartment building a little early and had to wait a few minutes for her to arrive, but when she got there at about 10.20am she lit up the room with her energy and vitality. Even after having attended a presentation in Sharjah at 5am earlier that morning she was dynamic and bouncing with enthusiasm. Soon afterwards, several of the volunteers that Roshni had organised to assist with the day’s work also started arriving. We met a lady who happened to be from Mulgrave in Melbourne (two suburbs away from my parent’s house – it sure is a small world). Also helping out was an Italian catholic nun. Yep! Habit and all! I must admit it was strange to see a nun in a Muslim country. Certainly, it was a first for me. Sister Agnes has been helping out with Karama Kanteen for a couple of years. I got the chance to talk to her a little, and she was so sweet, warm and generous. I hope to meet her again the next time we attend one of Karama Kanteen’s events. After the other volunteers arrived we all drove to the restaurant where we were to buy the food for the day. We loaded up the three cars with boxes of hot chicken biryani, mint sauce, pickles and crispy pappadums. And then we set off for Sharjah, a convoy of delicious smelling vehicles. It really did smell incredible, and my mouth was watering! It felt great to know that we were giving out quality food that I would have liked to eat myself!! Nothing but the best for our guys. David helping to load the boxes of food. All the volunteers loading the boxes into the cars. 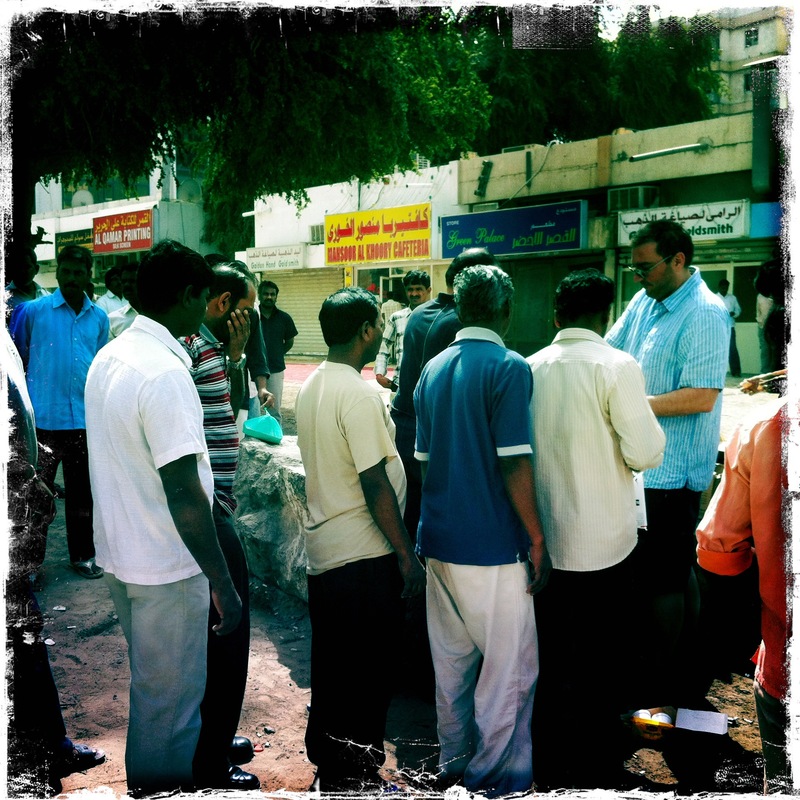 When we arrived in Sharjah there was already a line of about 75 men, queuing up in anticipation. They were all dressed very nicely in pants and brightly coloured shirts. These guys work six days a week, 12-14 hours a day. During these long work hours, they must wear coveralls (the colour depending on the company they work for) that remind me of the jumpsuits Death Row prisoners in America must wear. And in a way, they both serve the same purpose – to dehumanise the person wearing them. It was nice to see them in their off-duty clothes looking like regular guys. The handout happened in a sandy square, dotted with a few trees and anchored by a huge boulder in the centre. It was on this boulder that the volunteers started unpacking the boxes and preparing the food. We all worked together to bring the different elements of the meal into one plastic bag to hand to the men. Because David and I had organised this donation, the others were kind enough to allow us to hand out the food. It was a lovely gesture because it really felt more personal, actually giving the food to each person ourselves. What I found interesting was that after passing the bag to each man with the handles closed (to make it easier for him to take it), I realised that they would, almost without exception, open the bag to look inside. So, after a while I started passing the bag to them open. They seemed to like this better and the line moved quicker after that. All the volunteers worked so well together, like a well-oiled machine, to make sure that everyone got their meal before it got cold. It was so wonderful to be part of this great team, even for just one morning. 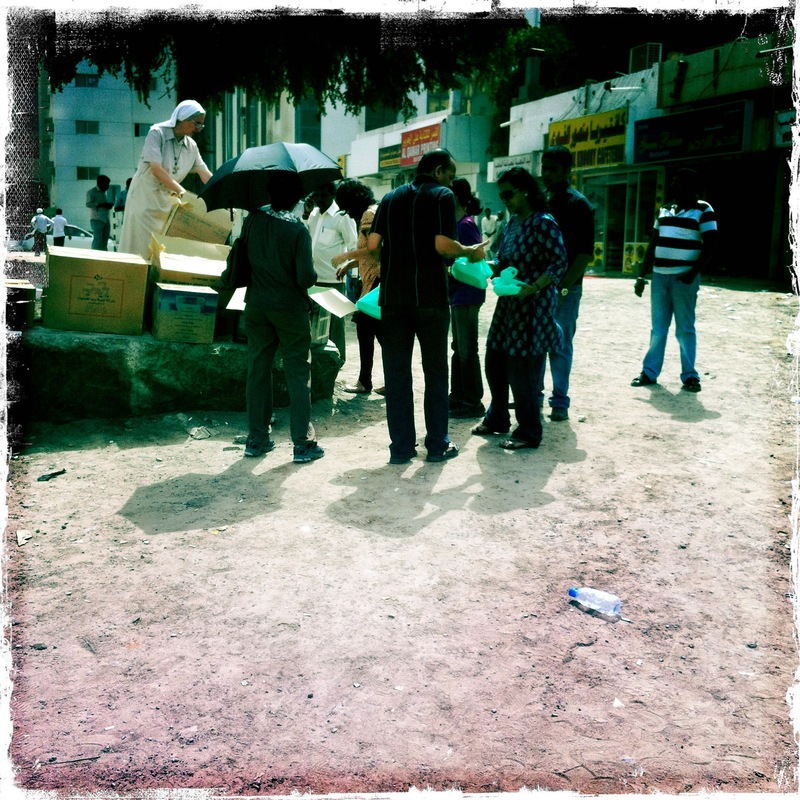 Sister Agnes helping to unpack the food on the large boulder in the square. A long line of hungry guys. Not all the men were able to express their gratitude but a great many of them looked me in the eye and thanked me with a shy smile, wishing me a good day. It was these exchanges that really touched me and made the effort of what we were doing so worthwhile. I wish that those of you who helped to finance this cause could have been there to help out with the distribution. The feeling was incomparable. But please let me just say thank you, from the men and from me, for your generosity and kindness. Without you some of these men would have gone hungry. I know that our contribution is just a drop in the ocean, but surely every single drop helps? David finishing off the handout. After all the food was gone and we were packing up, I noticed a large group of men had gathered around Roshni. They were asking for her help. They needed assistance with medical problems, visas, looking for work or even perhaps repatriation back to their home countries. In a way Roshni is indeed like an angel of mercy (though I’m pretty sure she’d hate to hear herself referred to in that way). All of the men treated, and spoke to her, with a great deal of respect and reverence. One man even trembled as he pulled out his passport to show her. He was very nervous and the fact is that she is probably his absolute last hope for help. What Roshni does each and every week is provide an incredible service to the neediest people in this country. She steps in and does whatever she can, when the government and the rest of society just turns away. It felt great to contribute just a small bit towards what she does every week, but more than that it actually felt like an honour. Roshni holding court - looking over paperwork, trying to help in whatever way she can. I was so blown away by how much my friends and family from Australia and America contributed. I mean, I am directly affected by these guys on a daily basis. Their plight assaults me every day. I kind of feel like I have no choice but to do something to help them. But you guys, the ones that gave money, are thousands of miles away. The labourers’ problem can only really be just an abstract notion, and you still found it in your hearts to dig deep and give. I take my hat off to you all. Not only that, most of you said that you’d do it all again the next time. That has inspired me to organise an event like this once a year. I will probably continue to personally contribute food to the labourers and workers of Dubai on a regular basis (albeit on a smaller scale) but I plan to make this larger donation an annual project. So, expect me to nag you for more funds this time next year!!! In the meantime, if anyone wants to just make a general contribution, it will always be welcome and I promise to always make sure that 100% of what you donate goes to the workers. On that note I’ll leave you with a quote that Roshni signs all her emails off with. “Life becomes harder for us when we live for others, but it also becomes richer and happier”.